The gluten free food market has risen from strength to strength riding on the back of the soaring popularity of the food type to combat gluten sensitivity in worldwide population. World over, the proliferating demand for gluten free foods among people with celiac diseases has provided a firm base for the market to evolve. The various digestive benefits gluten free food possesses, along with the beneficial effect on intestinal health, has made the food popular in treating a range of metabolic disorders in worldwide population. The rising preference of gluten free food has in recent years created new revenue streams for food and beverage manufacturers. Several food producers have made a foray into the market with unique positioning strategies to reap the gains. A growing number of players are also harping on multiple selling channels thereby expanding the retail overreach of gluten free foods. This has substantially increased the availability of products across groceries, supermarkets, and other points of sale. Recent innovations brought in the taste and flavor of gluten free food has added to its popularity among weight-conscious populations. The attractive and sustained demand for gluten free bakery products is also contributing to the global market revenues. Bustling with opportunities, the global gluten free food is projected to rise at a promising CAGR of 7.7% during the forecast period of 2015–2021. The market stood at US$2.84 billion in 2014 and the opportunities is projected to surge to touch a valuation of US$4.8 billion by the end of the forecast period. Based on product type, the market is segmented into bakery products, baby food, pasta, and ready-to-eat meals. Of these, the bakery segment is projected to rise at an attractive CAGR of 8.5% over the assessment period. The growth is propelled by the extensive demand for various types of bakery products and the easy availability of gluten free options in retain stores. Meanwhile, the rising number of diabetic population who show an inclination toward the consumption of bakery products is also catalyzing the growth of the overall market. The expanding retail footprint for the sale of gluten free bakery products, especially in developed nations, is also providing a sustained impetus to the segment. The various regional segments are North America, Europe, Latin America, Asia Pacific, and the Middle East and Africa (MEA). Of these, North America accounted for a prominent share amounting to 23.2% share in the global market in 2015. The regional market will continue gaining shares over the forecast period, rising at a robust CAGR of 11.4% during 2015–2021. The growth of the regional market is attributed to the rapidly rising demand for gluten free bakery products. The elevated level of awareness about the potential benefits of gluten free foods among the regional population is also bolstering the demand. The substantial incidence of celiac diseases in the U.S. and the subsequent rise in health concerns is boosting the regional market. Furthermore, several regulations put forth by the U.S. FDA which requires manufacturers and producers of gluten free food products to adhere to norms augurs well for the North America market. Furthermore, numerous prominent market players in the region are likely to focus on improving the attractiveness of gluten free foods by adding value to their brands. The rising number of people with gluten sensitivity and celiac disease is a key factor driving the global gluten-free food market. In addition to this, gluten-free diet is also associated with weight management and overall health, further driving its demand. These factors, coupled with the rapid change in consumer lifestyle, are anticipated to push the global gluten-free food market to expand at a steady pace over the coming years. The gluten-free food market is segmented on the basis of product type and geography. By the type of product, the market is categorized into baby food, ready-to-eat meals, bakery products, and pasta. By geography, the gluten-free food market is divided into Asia Pacific, North America, Latin America, Europe, and the Middle East and Africa. The report on the gluten-free food market is a comprehensive evaluation of the scope and dynamics of the global market. It focuses on the key growth trends and determining factors that have had an impact on the gluten-free food market in the past and forces that are likely to influence its trajectory in the coming years. Valuable insight into the workings of the global gluten-free food market has been provided by industry experts and analysts to give readers a clear, unbiased, and in-depth understanding of the market. The report states that the global gluten-free food market is poised to expand at a 7.70% CAGR from 2015 to 2021, rising from a value of US$2.8 bn in 2014 to US$4.8 bn in 2021. 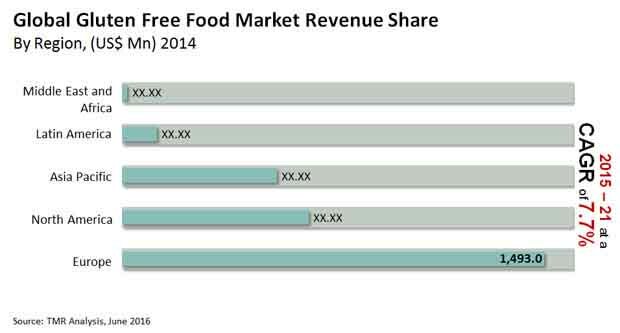 By volume, the gluten-free food market is anticipated to grow from 277.2 thousand metric tons in 2014 to 423.0 thousand metric tons in 2021 at a 6.10% CAGR therein. This growth can be attributed to the rising demand for innovative gluten-free bakery products, the growing focus on weight management, and the increase in public awareness regarding the potential benefits of gluten-free food. On the flip side, the lack of awareness about celiac disease is anticipated to hamper the development of the gluten-free food market. The gluten-free food market is dominated by gluten-free bakery products. This segment comprises biscuits, donuts, muffins, bread, cakes, pies, and pastries. Region-wise, Europe holds the largest share in the global gluten-free food market, making up 52.5% in terms of revenue in 2014. North America is likely to be the fastest expanding regional market by 2021 fueled by the positive consumer response to gluten-free diet and the rising number of patients suffering from celiac disease. The leading companies profiled in the gluten-free food market report are Genius Foods Ltd, Freedom Foods Group Ltd, Dr Schar AG/SpA, Hain Celestial Group Inc, and Boulder Brands Inc. These players are evaluated based on key criteria such as company overview, business strategies, product portfolio, financial performance, and recent developments.